Provide comfort for the family of Melvin Overweg with a meaningful gesture of sympathy. 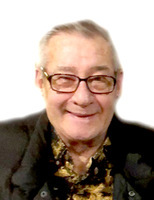 Melvin Overweg, 80 of New Holland, SD passed away Wednesday, January 2, 2019 at his home. Funeral Services are 10:30 A.M. Saturday, January 5, 2019 at the New Holland Christian Reformed Church. A Committal Service will follow at the New Holland Cemetery. Visitation will be held from 5:00 – 7:00 P.M. Friday, January 4, 2019 at Mount Funeral Home in Platte with a 7:00 P.M. Prayer Service. Melvin Overweg was born on November 14, 1938 to Martin and Josephine (Krediet) Overweg in New Holland, SD. He attended New Holland Christian Grade School and graduated from Corsica High School in 1956. He was employed as a Truck Driver, owned and operated Overweg Hardware in New Holland and was a dog broker of registered puppies of all breeds. On October 26, 1962 Melvin was united in marriage to Geneva Bultsma at the Platte Christian Reformed Church. Over the past 40 years, they opened their home to more than 90 foster children. Melvin was a member of the New Holland Christian Reformed Church. He enjoyed hunting, fishing, and collecting and trading guns and antiques. Grateful for having shared in Melvin’s life: his wife of over 56 years, Geneva Overweg of New Holland, SD; six children: Jackie (Bob) Holleman of New Holland, SD, Lyndon (Jana) Overweg of Mitchell, SD, Robin Overweg of Spearfish, SD, Shelly (Brian) DeGroot of Platte, SD, Bobby Overweg of Mitchell, SD and Brian Overweg of Mitchell, SD; 15 grandchildren: Troy (Regan) Holleman, Trevor (Beth) Holleman, Tommy (Cayla) Holleman, Mary Lou Siems, Cheyenne Siems, Taylor (Dustin) Wheeler, Morgan Overweg, Blair Overweg, Reed Overweg, Zach (Connie) Meyerink, Monte Meyerink, Suzi Meyerink, Jackson DeGroot, Sawyer DeGroot and Briana DeGroot; eight great grandchildren: Janaea, Brockston, Jade, Landry, Adley, Waverly, Finley and Henry; a sister, Harriet (Dan) Gruenewald of Pickstown, SD; seven in-laws: Elaine (Clarence) Boltjes of Platte, SD, Ted (Carol) Bultsma of Platte, SD, Frank Bultsma of Chicago, IL, Lorena Vreugdenhil of New Holland, SD, Dee (Don) Sorvaag of Sioux Falls, SD, Lloyd (Evelyn) Bultsma of Sioux Falls, SD and Larry (Keli) Bultsma of Phoenix, AZ; along with many nieces and nephews. Melvin was preceded in death by his parents, Martin and Josephine Overweg; his mother and father-in-law, Henry and Jessie Bultsma; and two brothers-in-law: Marlin Overweg and John Vreugdenhil. Memorials in Melvin’s honor may be directed to: Dakota Christian School, 37614 SD Hwy 44, Corsica, SD 57328 or New Holland CRC, PO Box 3, New Holland, SD 57364. 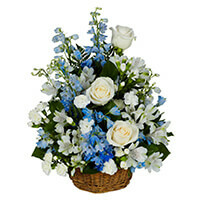 To send flowers in memory of Melvin Overweg, please visit our Heartfelt Sympathies Store. We encourage you to share your most beloved memories of Melvin here, so that the family and other loved ones can always see it. You can upload cherished photographs, or share your favorite stories, and can even comment on those shared by others. I was taken back when I heard of Mel's passing. Mel and Geneva where some of the first foster parents I met as a young social worker and they quickly became the gold standard in my mind for what fostering should look like. Mel loved rocking all the babies. He has left a legacy for his own family in addition to numerous little ones. I am blessed to have crossed paths with you. May God bless you Geneva as you navigate your life moving forward. 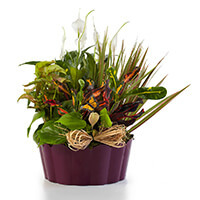 Fiedler family purchased the Plants-A-Plenty for the family of Melvin Overweg. Wishing you peace and comfort. And wishing you the courage to face the days ahead. Please know that you are in our thoughts and prayers. Sicangu Child & Family Services purchased the PEACEFUL WISHES BASKET for the family of Melvin Overweg. So sorry to hear about Mel. Mark and I are keeping you in our thoughts and prayers.